Gran Partita Bb Major K361 composed by Wolfgang Amadeus Mozart (1756-1791). Edited by Henrik Wiese. For Mixed Ensemble. Chamber Music with Winds. Henle Music Folios. Pages: Ob I, II * Clar I, IIB-flat, Hr I, II F*Hr III F, IV B-flat, F* Ba I, II* DB. Softcover. 145 pages. G. Henle #HN809. Published by G. Henle (HL.51480809).For 2 oboes, 2 clarinets (Bb), 2 basset horns, 4 horns, 2 bassoons, and double bass,“Wind music of a very special nature on a large-scale, a composition by Hr. Mozart.” This was the way the “Wiener Blöttchen” announced the concert in the National Court Theatre, in which the clarinettist Anton Stadler was to hold his academy. There were twelve wind instruments supported by a doublebass, which was a very unusual combination of instruments, and the contemporary critics raved about it, “Oh, what an effect it made – glorious and grand, excellent and exquisite!” The title “Gran Partita,” which was added to the autograph in an unknown hand, also bears witness to admiration and respect. Our edition is based on the autograph which has changed hands many times and is today held in Washington. 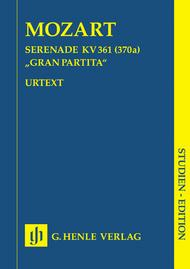 Gran Partita Bb Major K361 (Study Score). Composed by Wolfgang Amadeus Mozart (1756-1791). Edited by Henrik Wiese. For Mixed Ensemble. STUDY EDITION. Henle Study Scores. Pages: 77. Softcover. 84 pages. G. Henle #HN9809. Published by G. Henle (HL.51489809).For 2 oboes, 2 clarinets (Bb), 2 basset horns, 4 horns, 2 bassoons, and double ba“Wind music of a very special nature on a large-scale, a composition by Hr. Mozart” - this was the way the “Wiener Blöttchen” announced the concert in the National Court Theatre, in which the clarinettist Anton Stadler was to hold his academy. There were twelve wind instruments supported by a doublebass, which was a very unusual combination of instruments, and the contemporary critics raved about it, “Oh, what an effect it made - glorious and grand, excellent and exquisite!”. The title “Gran Partita”, which was added to the autograph in an unknown hand, also bears witness to admiration and respect. Our edition is based on the autograph which has changed hands many times and is today held in Washington.